This event has been postponed due to weather. New date announced soon. This Gold Star mom wants to talk to you about life, living, faith, honor and much more. 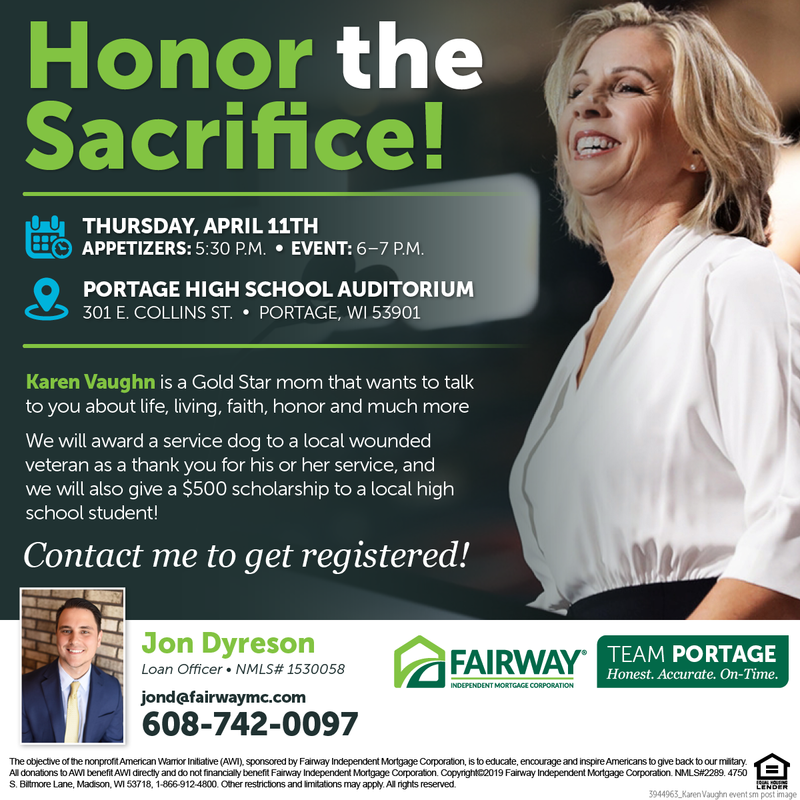 Karen Vaughn is a Gold Star mother and best-selling author of “World Changer: A Mother’s Story.” After her son, United States Navy SEAL Aaron Carson Vaughn was killed in action, Karen began a relentless pursuit to educate others about life, living, faith and honor. She is a strong advocate for soldiers and veterans and is also a member of The American Warrior Initiative (AWI), which is a nonprofit sponsored by Fairway Independent Mortgage Corporation that raises awareness and provides assistance to veterans in need across the United States. Awesome, inspiring and emotional are just some of the words that audiences across the nation use after listening to Karen speak. We will award a service dog to a local wounded veteran as a thank you for his or her service, and we will also give a $500 scholarship to a local high school student! Seating is limited, and we expect to have a full house. Register with Jon Jon Dyreson, Loan Officer at Fairway Mortgage.